Alicia Bridges was born today, July 15, in 1953. She is an American singer who co-wrote and performed her international hit "I Love the Nightlife (Disco 'Round)" in 1978. Bridges was born in Lawndale, North Carolina, a small town in Cleveland County. She sang from a very young age and learned to play guitar at the age of 10. At the age of 12 she had her own radio program, The Alicia Bridges Show, broadcast every Saturday on station WADA in Shelby, North Carolina. Occasionally she would sing on the show but has said what she is most proud of is that she "ran all the dials, the turntables, cued the records and made all the announcements live on the air." In 1977 she was signed to Polydor Records. Her 1978 hit single "I Love the Nightlife (Disco 'Round)" reached number five on the Billboard Hot 100 chart and also appeared on Billboard's "Hits of the World" chart. The song was also in the #5 position on the Record World and Cash Box charts. It was also a "crossover" hit, receiving play even on country music stations. The cover of the 1978 self-titled LP features an early skyline picture of Atlanta, Georgia. In 1978 Bridges was a Grammy nominee and was the opening act, performing "I Love the Nightlife." Bridges' self-titled LP, Alicia Bridges, was also rising on the Billboard, Cash Box and Record World charts and the LP remained on the charts for up to 35 weeks. 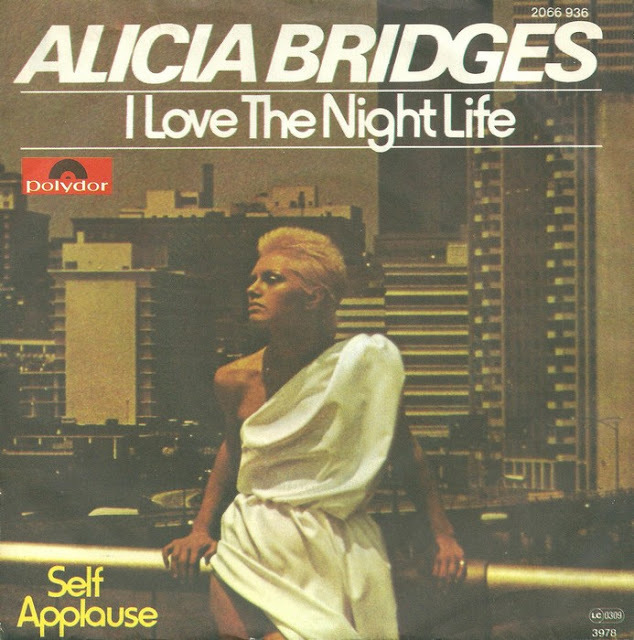 Both the LP and the single release were international successes, and "I Love the Nightlife" went top 40 in the UK and Germany, Spain and other European countries. Bridges' music was especially popular in Japan. She received an RIAA Certified Gold Record for the sale of over one million copies of her hit single in the USA, as well as a gold record from Canada. Contrary to the impression created by her success with "I Love the Nightlife," Alicia was primarily a singer of rock, blues and love songs. "I Love the Nightlife" has a definite back beat and organ similar to early 1970s R&B; the original intention was for "I Love the Nightlife" to be an R&B song, but when publishing mogul Bill Lowery first heard the song, he envisioned it as a disco dance tune. Soon after, Jim Burgess created a 12" single remix. Ultimately this mix became a worldwide hit. The song has been featured in several movies, including Love at First Bite, The Last Days of Disco and The Adventures of Priscilla, Queen of the Desert. Bridges is currently active in the music community as a producer and DJ. Her works, digital versions of her recordings, a blog and videos can be found on her official web sites, aliciabridges.com, discoround.com and ilovethenightlife.com. Bridges is an out lesbian. She has stated that as a teenager, she realized she was "different from the rest," as discussed during a 1998 interview for The Advocate. I have to say after hearing her sing and seeing the video of the song "I love the nightlife", I figured out she was a Lesbian before she officially came out.